Occupational therapy practitioners who work with cancer survivors must have a foundational understanding of how cancer and the associated treatments cause a changing trajectory of functional and cognitive abilities. 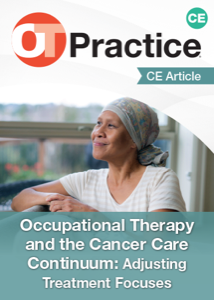 This article begins with an overview of cancer and treatments, discusses associated precautions and side effects, and then describes how occupational therapy services must be tailored to the client needs and desires during three periods: (1) diagnosis and during active cancer treatments, (2) after cancer treatments and into extended survivorship, and (3) in the setting of advanced cancer. Recommended resources are included to assist clinicians in remaining current with their knowledge of oncology to apply to their occupational therapy practice.